Going out to work for the first time can be very daunting for many young people, however my week in the hands of Katie and Leah from Walk in Wardrobe has demolished all those worries. My name is Imogen Smith, 15, from Longhill High school and I have been working at Walk in Wardrobe as part of my work experience. As I am interested in fashion and the world of retail I thought this would be the perfect place to spend a week off school. I have learnt a lot in the past week; from how to sew on a hook and eye, to how to keep a business going in these tough times. However, the main thing Katie and Leah taught me was about customer service and how to give a personal shopping experience. With their warm personalities and expert knowledge of their industry, they are able to offer help and guidance for customers to find an entire outfit: dress and all accessories. At Walk in Wardrobe, Katie and Leah will be able to find the perfect outfit for you to go to the races, a wedding, prom etc. They have recently expanded their daywear section so they can also help you select the perfect outfit for the day. You hear all sorts of rumours about work experience and how the employers restrict you from doing anything, but my employers were determined to make my experience the best possible. They have shown me the ways of a business and the importance of reputation in business, that making friendships with customers and clients can build up your customer base. They also found it was important to them to give me an opportunity, even when they didn’t have to; proving they go out of their way to do what they can to help. The boutique also has a beauty therapist, Louise, who works downstairs at Tranquilty. Not only does Walk in Wardrobe benefit from Louise bringing new customers to the boutique, but Louise also benefits from the boutique sending customers to her for beauty treatments. Fashion and beauty work very well together and brings a new, more personal touch to the business. Another aspect that I love about the boutique is that you can hire most items which allows customers to find new outfits for special occasions and not have the problem of not wearing them again and at the same time you won’t be breaking the bank! Overall I feel that I have had a full experience of what the industry is like. I have found that hoovering and cleaning is only normal but also helping someone find their next new favourite is all part of the job; therefore I have experienced it all. I am extremely thankful to Katie for allowing me to help her (I hope) for the week, additionally Leah both for giving me such a happy, exciting and helpful week. But to conclude, over the past week I have found that I now know exactly where I shall be getting my prom dress and other outfits for all kinds of occasions, because why would I want to go anywhere else? Especially when I know I can get the best clothes at the best prices with the best quality and above all the best look! This week witnessed the opening of the brand new Adur Ferry Bridge on the South Coast. 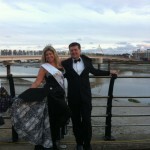 This event was filled with royalty, fireworks and of course thousands of people doing the conga over the bridge! 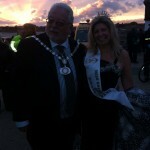 Katherine Tanswell, proprietor of Walk in Wardrobe was thrilled to be able to attend this massive event in Shoreham and to join in with the conga fun wearing a glamorous dress from Walk in Wardrobe before relaxing and watching the fireworks. Skater dresses are fast becoming a staple dress for the summer, and celebrities such as Kim Kardashian and fashionistas across the globe are succumbing to the flared skirts and nipped in waists that a skater dress offers. The skater dress is a modern, fun and flirty alternative to the A-line dress. The A-line is narrow at the waist, and gently flares out the bottom, giving you (as the name suggests) an A shape. Skater dresses are similar, but are more defined, with a sharper nipped in waist, is shorter than a traditional A-line dress, and flares out more to give it a shape similar to what an ice skater would wear. Hence the name! The only way to answer this is with one word – yes! The smallest part of any woman is the waist, but this can be hidden with ill fitting or looser clothing. The skater dress’s simple structure at the bust which goes towards the sharply nipped in waist and comes out to the (usually) full pleated, hip skimming skirt gives the illusion of an hourglass shape. Shoes and accessories to wear with a skater dress. One of the things I love about skater dresses is that they are so versatile. 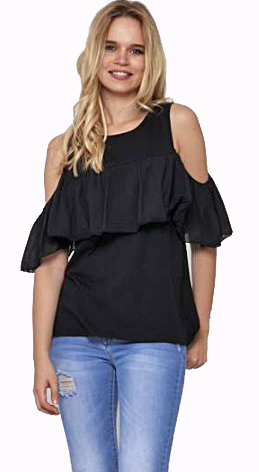 They can be dressed up for a smart casual event, or can be dressed down as a day dress. If you are wearing your skater dress for a more formal event, team it up with a pair of heels or a pair of heeled sandals. Make sure you have lots of sparkly accessories to jazz it up. If you intending to wear your skater dress as a day dress, you can dress it down with a pair of pumps or chunky shoes or sandals. If you want to keep a bit warmer in your day time skater dress, you can even add leggings for a more casual look. For a really cute 1950’s style look, you can team up the dress with some girly, frilly socks (this also adds to the figure-skater feel and will keep your tootsies warm!). This is a fabulous dress which you can carry on wearing into the autumn time, just add a cardigan for warmth. This beige lace and black skirted skater dress (pictured) has been a fantastic addition to the Walk in Wardrobe range. This skater dress is slightly dressier than the ones you would find on the high street due to it’s lace bust and lace sleeves. The skirt of the dress is made out of a gorgeously high quality weighted fabric, meaning that you will be able to walk around confidently even if there is a strong summer breeze!